The questions seem simple enough. 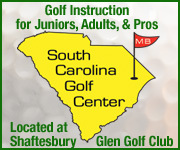 Why would the well-respected Bald Head Island Club choose to make changes, in an economically challenging time, to a golf course and community that in the last 5 years had garnered numerous lofty awards (“Top 10 Coastal Courses”- NC Magazine, “America’s Best Places to Play,” Golf Digest, “Carolinas 100 Must Play Courses,” Golf Styles Carolinas, “America’s Top 100 Golf Communities,” Travel and Leisure Magazine, etc.)? Wasn’t it enough that Bald Head offered what was considered to be a very good golf course as part of one of the most distinctive island experiences you’d find anywhere? “Before and After” Gallery. Click a photo for enlargements. The fact that the golf course had indeed received high praise of late speaks to the aforementioned “island experience” itself. Such is the wonderfully unique quality of a trip to Bald Head Island (located 2 nautical miles off the southeastern coast of North Carolina, a relaxing 20 minute ferry ride from Southport), of the highly restorative aspect of a day, a week, or a life there, and of all that the barrier island offered (golf carts/bicycles only, miles of unspoiled beaches), that the state of the 35- year old golf course might easily be forgiven. The Bald Head Island Club golf course originally opened in 1974, and was designed by George Cobb, who counted the Par 3 course at Augusta National among his over 100 southeastern course designs. 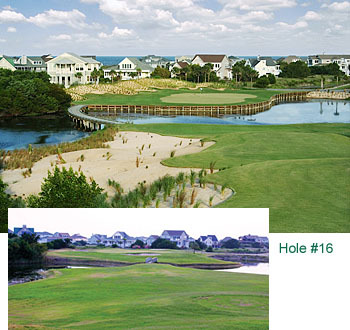 Cobb had created a solid, if understated, layout, and the chance to include golf, almost 4 decades ago, as part of a Bald Head Island sojourn was indeed a welcome addition. 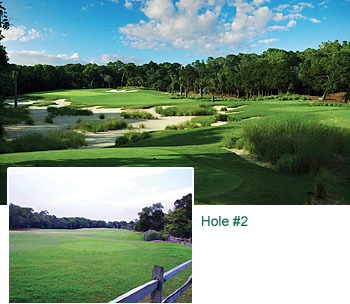 Over the past decade, however, time began to take its toll, and according to Robert Norton, General Manager of the Bald Head Island Club, whose years of experience in the private club/golf course industry helped steer the upcoming decisions, it was time to reassess the course’s place in the Bald Head Island scheme. 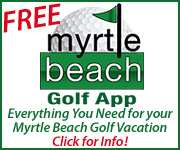 “After more than 35 years of strong ocean winds, intense summer suns, and thousands of rounds of play, The Bald Head Island Club course was getting a bit tired,” he said. “Our greens had outlived their useful life, and as time passed, some elements of the course had begun to present unfair challenges.” Quietly, subtly, the golf course had gone from a major draw for members and package players alike, to a less-than-compelling aspect of time spent on Bald Head. And so, a few years ago, The Club’s Board of Governors and membership began to consider necessary changes, and started a process that was thoughtful and meticulously planned, a model of research and execution, and one that has yielded fantastic results. The understandable first step, given both the physical restriction of an island renovation and the economic environment, was to concentrate restorative work on the course’s greens (which had, in essence, gone twice normal life expectancy), as well as to rebuild the course’s tee complexes. Once that determination was made, the obvious next consideration would be the most important one. Who to carry out the plan? Enter Tim Cate, the award-winning architect who has devoted his career to raising the level of design excellence in his native coastal Carolina. 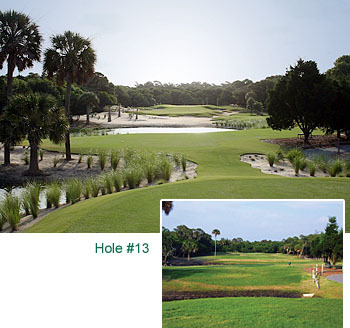 For almost two decades Cate has created some of the most popular and decorated layouts on the Grand Strand (his Tigers Eye and Leopards Chase courses at Ocean Ridge Plantation and Thistle Golf Club in Sunset Beach, NC have been included on numerous national “Best of…” lists). His dedication to the coastal environment and his attention to detail as well as to the aesthetics of course design and renovation made him a perfect choice to carry out the delicate work on Bald Head. Using George Cobb’s original drawings as the basis for the renovation, Cate rebuilt the golf course closer to Cobb’s original design, in a way that maintains Cobb’s “feel,” that fits into the environment at Bald Head naturally, seamlessly. Calling the Bald Head location “one of the most unique coastal landscapes you’ll find anywhere on the East Coast,” he has taken full advantage of its high native dune ridge, rare coastal maritime forest, and network of inland lagoons, with 7 holes offering sweeping views and windswept playing conditions on the ocean side of the dune ridge, and 11 holes winding through stately, spectacular live oak, pine, and bay tree forest. Cate has combined his artist’s sensibility, an eye for beauty, an understanding of the necessary strategic changes, and a knowledge of state-of-the-art environmental enhancements into a transcendent golf experience. Once the decision was made to go ahead with the full renovation, the dedication of the Board and the membership became more evident. In a difficult economic time, the cost of closing the course for some five months and of spending $3.9 million dollars was an obvious commitment. The challenge of restoring an island course, where every bit of material, from the largest and heaviest roll of sod down to the smallest and lightest flower, had to be carried over by ferry, put on full display the massive scope of the work, as well as Cate’s knowledge and expert guidance of his talented team. The golf course itself is a revelation. Though only 6823 yards from the back tees, it offers a tremendous challenge for the best players (due to the ever-present winds and the new strategic additions), as well as a totally enjoyable day for higher handicap players. Ten fairway landing areas were widened to make water hazards more visible from tee areas, eliminating blind tee shots toward water. 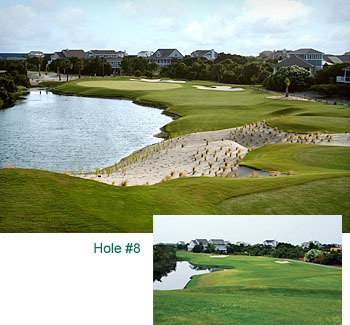 Eight holes were completely altered to make them either more playable or strategic. 35 acres of turf grass were converted to natural sand areas, not only making for dramatic visual contrast, but eliminating the need for mowing and fertilizing on 1/3 of the previous mowable area. 12 lagoons were enlarged or reshaped, 3 of them bulkheaded. New bridges were built, cart paths rebuilt with concrete brick pavers and lined with cedar rail fencing. The tees and greens, which started the whole process, received lavish attention. New, multi-tiered tees were elevated 8-12 feet on average and nearly tripled in size, with 4-5 generous teeing areas per hole providing alternate set-ups depending on the ever-changing wind coming off the ocean. Greens were expanded on average from 5500 sq. ft. to 7,000 sq. ft., to also anticipate the windy conditions, and additional undulations were added to Cobb’s designs to provide more pin placement opportunities. Greens were elevated or green surrounds lowered to provide elevation contrast, and Cate even built two-tiered greens on #12 and #14, part of Cobb’s original design that were never built due to budgetary concerns. Finally, with new MiniVerde Ultradwarf Bermuda grass as the surface of choice, strategically tested before work began, the greens are, in a word, perfect. 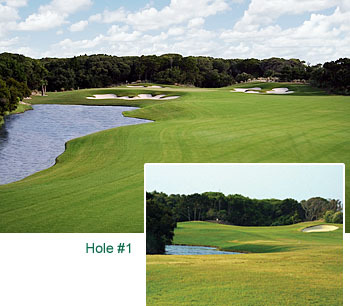 In use by the PGA Tour at the TPC-Sawgrass, home of the Players Championship, and at Eastlake Golf Club, site of the PGA Tour Championship (a similar longitude to Bald Head Island), the MiniVerde offers faster speeds and a truer, smoother putting surface, making for a flawless finish to each picturesque hole. The 16th hole at Bald Head is a dazzling example of the full repertoire of changes, in one magnificent package. Cate added a 20′ high, perfectly landscaped dune as a backdrop and guardian to the new Par 3 green, which he also moved slightly to the right. Beautiful new tee boxes were elevated 10-12 feet, to enhance ocean views and deliver a 180 degree panoramic vista, as well as to make the tee shot even more demanding. A serpentine bridge now leads golfers from the tee to the green over an enlarged 3 acre lagoon. 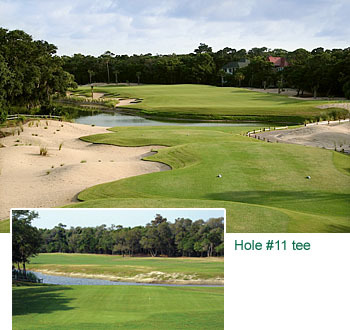 It is, as are many of the holes at the new Bald Head course, truly unforgettable. In addition to the course renovation, there has also been a commitment to changes that expand an already breathtaking natural environment. You’ll see everything from nesting osprey to 10′ gators, from deer to Great Blue Heron, all evidence of a matchless setting that perfectly reflects the goals of an applied-for Audubon Sanctuary location. 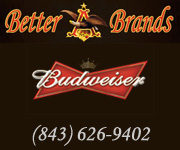 Add a new 10 acre practice complex that includes target greens and bunkers, a 3000 sq. ft. chipping green with 5000 sq. ft. of pitching and practice space around it, a 6000 sq. ft. putting green, and an “it’s-about-time-someone-did-it” waste/natural area practice area, and you’ll find that you might really never want to leave Bald Head Island. By pure coincidence, George Cobb and Tim Cate both graduated from the University of Georgia with degrees in Landscape Architecture, 47 years apart. 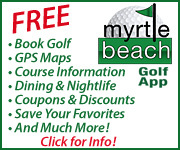 Though they never met, they will now be connected by their work on a Bald Head Island Club Course that has rightfully taken center stage. It is now a worthy headliner on the Island, historic by nature (3 Civil War era skeletons were even found near the 7th green during the renovation), lovingly brought to life once again by Tim Cate. It is reason enough to visit Bald Head for the day or to decide to live there permanently, a golf course fully capable of gathering the respect and awards that will surely follow a renovation of major, and exquisite, proportions.